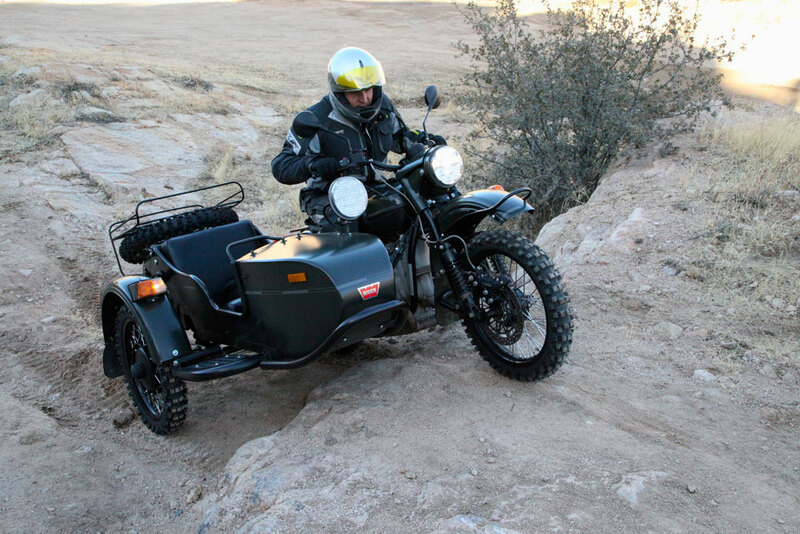 The Ural Gear Up is a formidable machine. Its secondary driving wheel, broad stance, grunting power, and tank-like construction make it capable of traversing seemingly impassible terrain. That doesn’t mean it is without limitations. 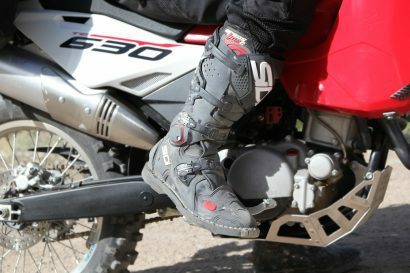 The dry clutch and tall first gear can be challenging, and its size often conspires to bring progress to full stop. For a solo traveler, these are heady considerations when faced with what could be a route-thwarting obstacle. That is unless your Ural Gear Up is fitted with a Warn winch. Last year, Overland International’s Brian McVickers began a collaborative project with Ural, Warn, and Kalaber Creations to create a unique winch system specifically designed for the Gear Up. It has undergone a few evolutions in the past many weeks and is now approaching the finished product. 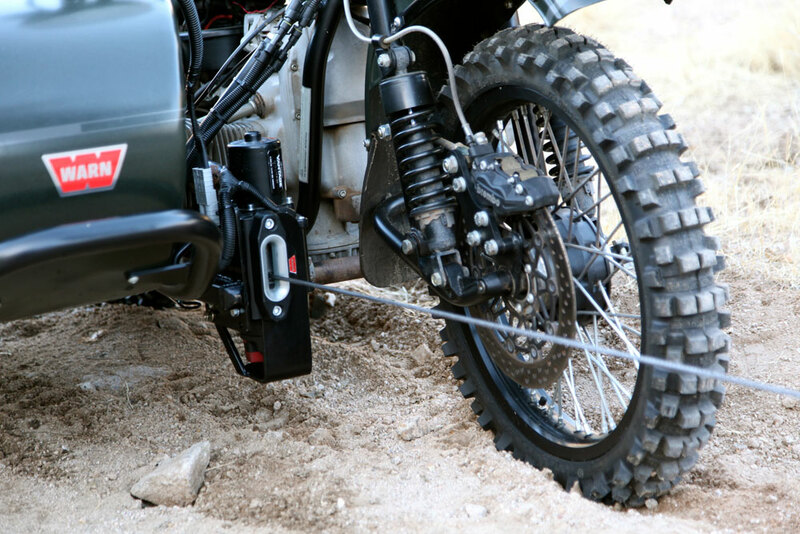 A modular system consisting of a dual-ended mount, it allows the winch to be used on either end of the motorcycle. That mount is directly bolted to the central aspect of the Gear Up’s frame at three points creating a stout anchor for the winch. We recently spent some time testing the system, and by all accounts it’s a complete success. At the heart of the system is Warn’s ProVantage 2500-S winch fitted with 50 feet of synthetic line. Designed for ATV use, it is a compact winch with all the power required to extract the Gear Up from any potential recovery situation. Installation of the winch and its various components did require some creating thinking, but mounting options abound on a platform like the Gear Up. One of the more delicate components, the winch solenoid, was placed in a protected location beneath the seat giving easy access to the battery terminals just below. The handlebar switch was mounted by the right-hand controls providing easy access to the winch functions without compromising the ability to work the throttle and brake. The more complex issue to be resolved was how to route the winch wiring leads. 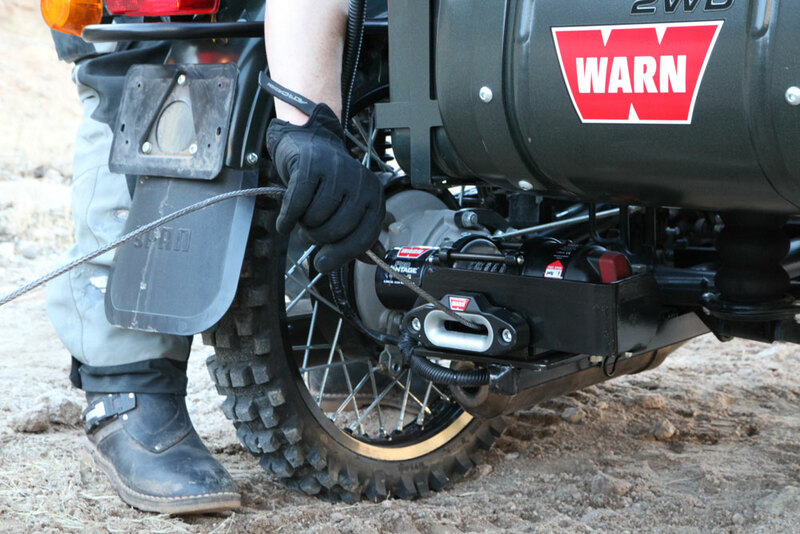 Using large gauge Anderson plugs for maximum durability, the winch can be quickly disconnected for an easy transfer from one end of the motorcycle to the other. 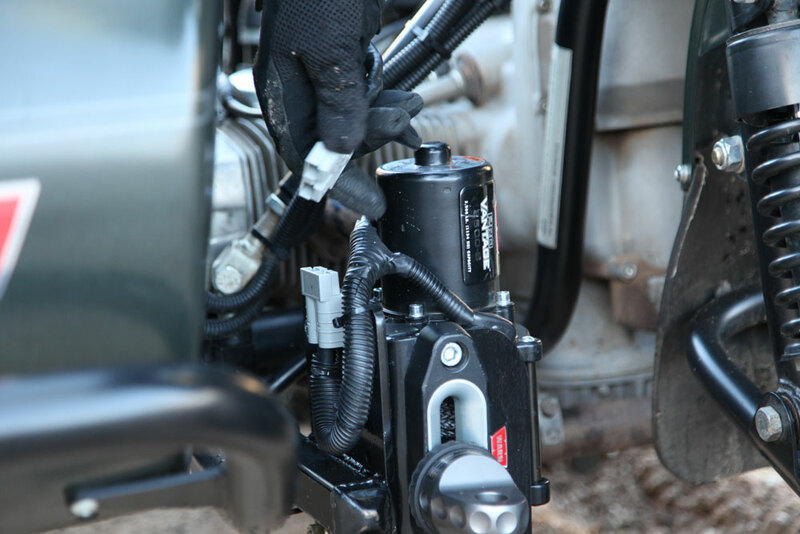 This also facilitates easy removal of the winch if it is not needed for a given ride. The central location of the winch is critical to maintaining optimal balance and control without upseting steering and braking inputs. Connecting the Anderson plugs takes but a couple seconds. 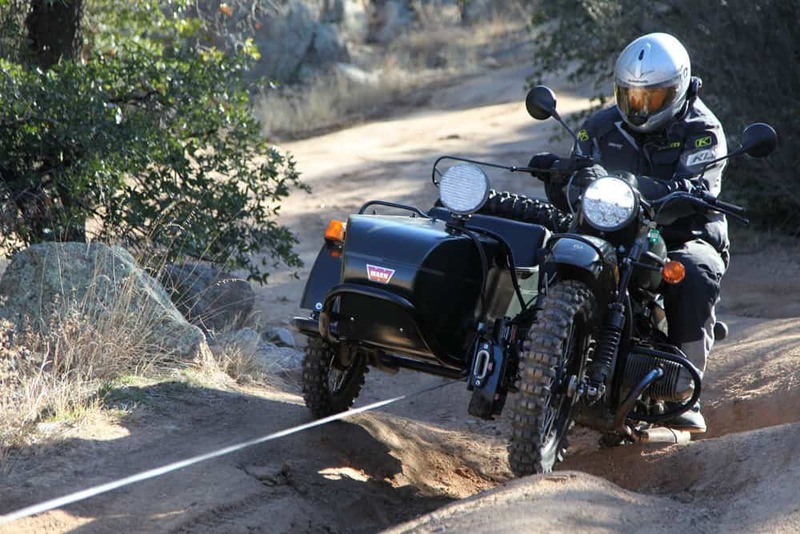 In evaluating the effectiveness of the winch system and how it’s best applied to the Gear Up, we had to exploit the motorcycle’s inherent weaknesses, and construct scenarios where the winch might prove most useful. All riders have encountered daunting ruts and steep ledges. For the Gear Up, these obstacles can be even more intimidating as the possibility of flopping over backwards is very real, and could culminate in disastrous results. Even if a rider survived a backwards tumble, righting a capsized Gear Up without assistance would be…tough. 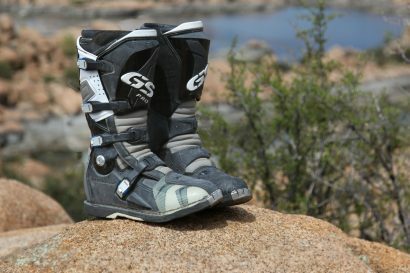 While the Gear Up can often conquer sizable ledges, the speed and forward energy required to do so is unnerving, if not wholly unsafe. Winching over these impediments considerably reduces the risks to rider and machine. What goes up, must frquently come down. While the Warn ProVantage 2500-S is not designed for lowering a vehicle, it would be possible to use the winch as a stabilizing element when dropping off these same steps and ledges. Since this type of operation is technically outside the design perimeters of the winch, extra care would need to be exercised as to not shock-load the system or destroy the inner mechanicals of the winch. It would perhaps be a procedure of last resort. The Gear Up probably could have climbed this ledge under its own steam, but it would have not been without some risk to the bike––and rider. Winching up this ledge was an effortless task for the ProVantage. We tested the winch on considerably steeper ledges with equal success. The lowering test proved insightful. Easing the Gear Up off steep ledges can be challenging and using the winch adds a reassuring level of security. The first few tests revealed some happy accidents of design. With the line spooled out, it became apparent that a solo rider may have difficulties spooling that line by themselves. As it turns out, the control switch and winch fairlead are just barely within arm’s reach of each other. One of the primary concerns with the design of the mount was the protection afforded to the winch itself during aggressive riding situations. To that end the winch mount includes a small guard, which we immediately put to use proving it’s a very necessary feature. It has since been decided that the rear mount would be the ideal location for the winch for regular transport with the front location reserved for scenarios when the winch might be repeatedly put to use. Even in the more vulnerable spot up front, the steel guard should be ample protection for the winch. 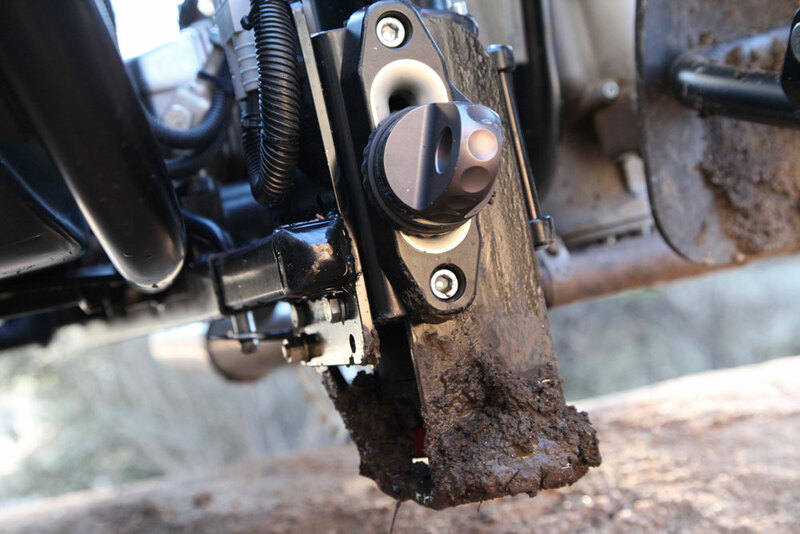 The rear mount tucks the winch out of the way during regular riding when it is less likely to be needed. 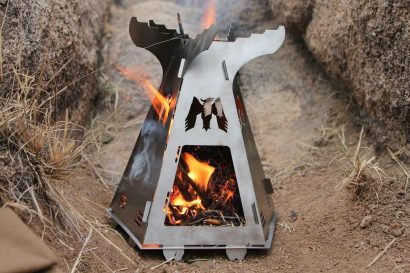 It remains high enough to not risk impact on aggressive trails. 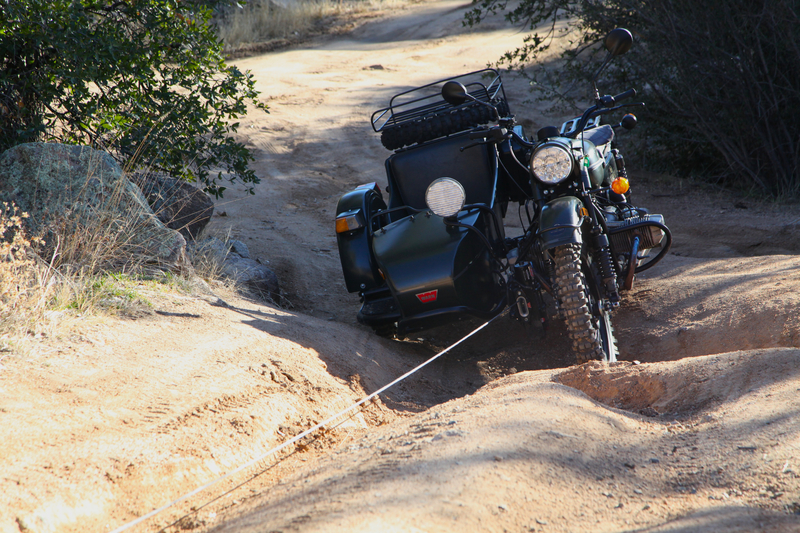 In testing, operating the winch and controlling the motorcycle at the same time didn’t prove to be overly complicated. 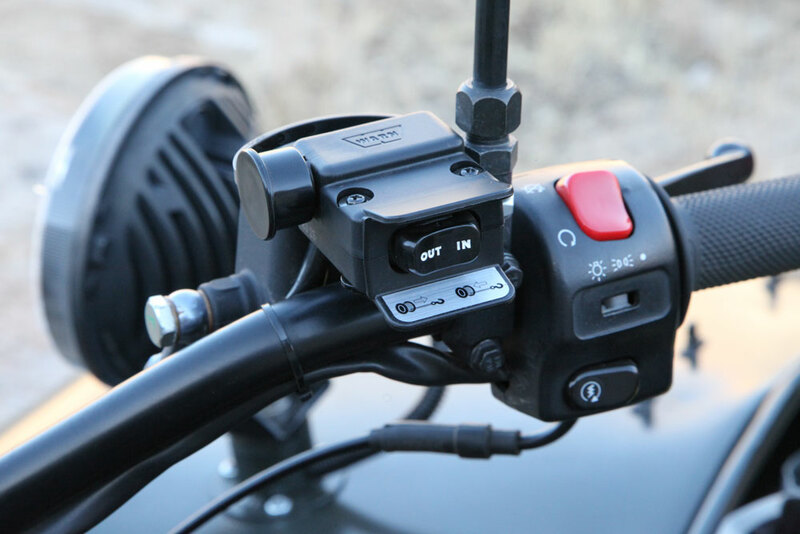 The switch is easy to actuate and doesn’t conflict with the operation of the motorcycle itself. 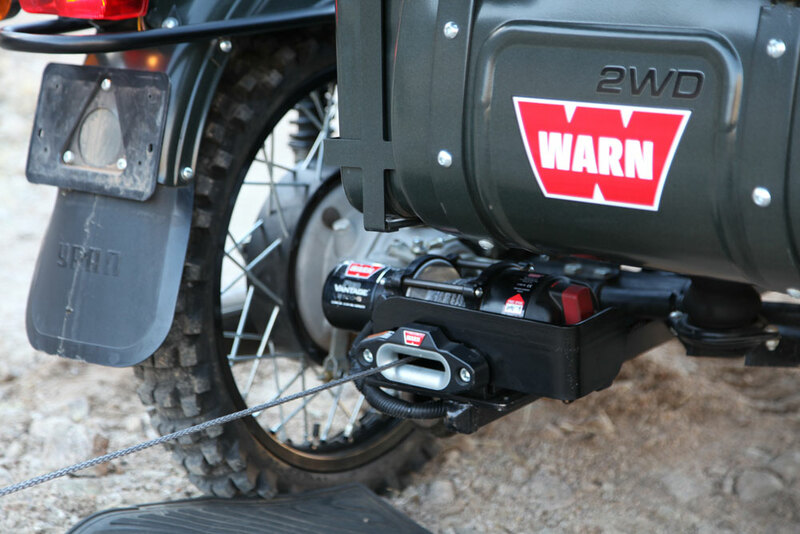 The Warn ProVantage pulls with a slow and deliberate pace and the central location of the winch on the motorcycle keeps everything balanced and doesn’t compete too much with steering inputs or suspension compression. 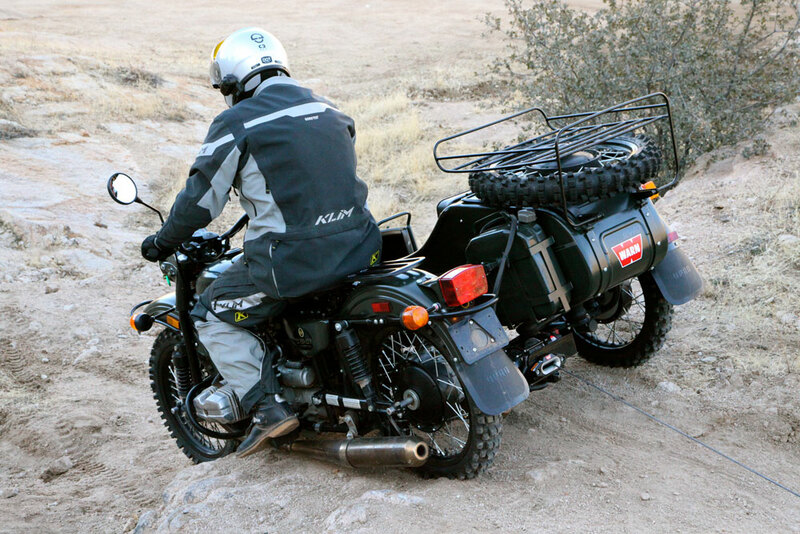 It’s worth saying again, it’s quite amazing where a Ural Gear Up will go under its own power. Deep sand, rocky climbs, and muddy tracks are all easily overcome objections for these Russian beasts. The addition of a winch simply increases its operational abilities and greatly reduces the risks associated with traversing some obstacles. There is an old adage that says capable vehicles don’t get you out of trouble, they get you into bigger trouble. That may not be accurate as a whole, but I can see how it applies to the Gear Up. Having a solution to get you out of that big trouble is not a bad idea.